eHarmony is one of the top dating sites for singles looking to find love and a serious relationship, and is a very popular choice for those hoping to find a partner for life. It is, in fact, much more than just a dating site thanks to the unique matching system that helps match singles that are compatible. This system is the result of many years of research into what it is that makes relationships successful. Even though our review shows them as one of the more expensive dating sites, eHarmony can nonetheless boast a very large number of members. They have members in many different countries, and this is probably one of the best known dating sites in the world. In many respects, it is also one of the easiest to use. You don’t have to spend your time searching through long lists of profiles as you will automatically receive matches that are deemed to be compatible thanks to the advanced matching system. Signing up at eHarmony takes longer than at most other dating sites, as there is a very detailed set of questions that you have to answer. This results in an in-depth profile being created, which provides a great insight into your personality and what it is you are looking for in others. This profile is then used to help match you with other compatible singles at the site. You do need to be prepared to spend quite some time going through this process, as there are a lot of questions to answer. Once your initial profile is created, you can then add further information. This stage is primarily about you describing yourself in your own words and you can also add a photo to your profile too. You are not obliged to do so, but it is strongly recommended and your photo will only be visible to potential matches and not every member of the site. You can do all this for free at eHarmony, but you will need to be a paid up member to start contacting your matches. You don’t have to submit your own searches at eHarmony, as the site will automatically send you matches based on the matching and compatibility system. There is a search function that you can use to filter through these matches based on certain criteria though, such as geographical location. You can then look through the profiles of potential matches and choose who you want to get in contact with. You are only able to get in touch with those members that have been selected as compatible matches. There is a process for contacting other members that have attracted your interest, known as “Guided Communication”. This is essentially a fixed format of communication that assists both parties through the early exchanges. One this is completed, members can move to open communication and exchange emails freely. The Guided Communication phase can be skipped if both members agree, but it is actually a great way to carry out the initial contact. Because of the way eHarmony works, and the fact that the process is managed very well, there is not much required in the way of additional features. It is worth nothing, though, that there are apps for the iPhone, iPad and Android phones – which offer all the main functionality of the site. There are also a couple of premium features (which cost extra) such as Secure Call and Premium Personality Profile. The Secure Call feature lets you talk privately with another member without either of you having to give out your numbers, and the Premium Personality Profile is an extended version of the initial personality test. The fees at eHarmony are higher than a lot of other dating sites, with a one month membership costing $59.95, but you can save money if you subscribe for several months at a time. A three month membership is $119.85, which works out much cheaper at $39.95 per month. A six month membership is cheaper still and at $179.70 comes to $29.95 per month. A one year membership works out at just $19.95 per month, paid in one installment of $239.40. These are the current prices for US residents and prices in other countries will vary. 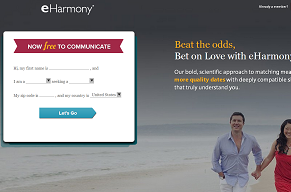 eHarmony is not a cheap dating site, but it still manages to offer great value for money – particularly if you take one of the longer subscriptions. This is not the dating site for you if you are looking for casual dating, but if you are serious about finding a long term partner then eHarmony is a great option. The scientific matching system has proved to be very effective for many people, and it makes it a lot easier for you to find someone that you are likely to be compatible with.